Thankfully, I’m all set with holiday gifts this year! But most of my friends and family are still rushing around trying to get presents. Some years seem more difficult than others to find inspiration on what to get people. This year I was on more of a budget, which I completely did not follow. Today I’d like to share a few ideas for gifts, especially gifts that aren’t too much money and will provide endless benefits to your loved ones. Let’s start off with stocking stuffers, my favorite 🙂 This is the first year my family is doing stockings; I’ve done them before with friends and have always found them to be fun to find things for. In the past I have done certain themes according to what a friend likes, e.g. if they love getting dolled up giving them little eye shadow boxes, gift cards to mineral make up shops, coupons for brands they have been wanting to try but haven’t yet and may be a little exfoliating cloth. The Leaping Bunny Program has a list of over 70+ coupons for vegan and animal cruelty free companies. There are some awesome brands on there like Aubrey, Meyer, Kiss My Face and Tallulah Jane. I found out about a raw vegan lip balm company through this page that I had never heard of before called, Hurraw! The ingredients are simple and are all natural or organic. Its $3.79 for most of the lip balms, the SPF and night treatment balms are $4.79. There are tons of tasty flavors such as grapefruit, lemon, licorice, cherry, coffee and root beer. Here is a list of where Hurraw! balm is sold. If you have any eco or animal loving friends making a donation in their name is always thoughtful. Some great organizations that have been doing extraordinary work such as Mercy For Animals; they are currently doing a deal where whatever you donate is doubled. MFA is all about defending animal rights and doing any research, investigations, campaigns and rescues to save animals. They have exposed numerous farms over the years for their barbaric treat of animals and the disgusting living conditions that most animals are born and die in. One of their most well-known investigations was on a large egg farm that provides eggs for McDonalds. The treatment of animals has been like these for years but so many of us choose to close our eyes and ears. It’s not like the chickens live in a children’s story farm where ole’ McDonald hugs his chickens and let’s them roam. These animals typically live in conditions that are against health violations. If you have the time please read the articles on MFA’s website and watch some of their videos. I’ve seen dozens of animal farm and factory videos before but to see the violence that goes on and how the animals are standing in cages with poop inches up their legs may spark something in your mind. Besides putting lip balm and donation letters in stocking I love giving reusable grocery bags, candies, and gift cards. These Chocolate Almond Truffle Pops look delicious, simple, cute, and most of the ingredients are probably in your house already. It’s only around .49 cents per serving too! Have fun wrapping these up like lollipops or handing them out to coworkers, friends and family. Homemade gifts are the ones that people remember the most. For loved ones who are veg heads or not giving them a gift card to a vegan or vegetarian restaurant is a great way of getting them to explore more foods. They may even be pleasantly surprised at how flavorful vegan & vegetarian food is. I’m also a fan of giving gift cards to local all natural and organic grocery stores. I have friends and family who consider going to these shops a special treat because they are such a budget that the first thing they decide to “go cheap on” is food. It’s very easy to spend little money on food if meals are planned out accordingly. Giving those treats like the one from Raw on $10 a Day or Less is a great example. This year I have a few friends who asked me to just make them a healthy meal and share the recipe with them. Something I already love doing! Gifts where I can teach or share a trade feel the most rewarding. I’m hoping I can do a gift trade with someone where they teach me how to knit or even do some simple car work for raw food or juice. Now for the big gifts! I asked for Kyocera knives, yoga classes and gift cards this year. I have expensive taste 😉 Some things I wanted to ask for that I’m sure other juicers and raw foodies have or wish they have are a nice blender and a compost bin. You’ve already heard me talk about the Blendtec several times so I won’t go there again. The compost bin I want is about $360, yikes! It’s a Nature Mill Metro Compost Bin that is currently on sale for $299.99. This compost bin is automatic and is made of stainless steel. There are two-chambers in the bin. The food is placed in the upper chamber and the compost needs to be removed every two weeks from the lower chamber. The bin has a capacity of 3 gallons (11 liters) and roughly handles a family of four or five. Plus, it operates at only 49 decibels for noninvasive use! For eco techies The Ultimate Green Store has some fantastic gifts like the Solar iPad Charger and Case. There are some cute organic baby clothes and fantastic shower heads & filters (something I could really use but keep pushing it off). There are also those gifts that keep on giving, like this mushroom growing kit from Ethical Ocean. I have a Hydros water bottle that I bought from this site with a built-in water filter that’s ideal for when I am on the go. The filter is good for 150 uses, so just imagine 150 less bottles being dumped in a landfill or in your recycling bin at home. Here’s the ingredient list from the moisturizer I purchased; Pigments of Peach, Apricot, Carrot, Pomegranate, Cocoa Bean, Goji Berry and Tomato, White Tea, Cucumber Juice, Aloe Juice, Acai Oil and Pomegranate Oil, Vitamin E (a-tocopherol), Vitamin C (ascorbyl palmitate), Rice Starch, Candelilla Wax, Extracts of Rosemary, Oregano, Thyme, Grapefruit Seed, Japanese Honeysuckle, Goldenseal and Cinnamon. I hope this little list helps all those last-minute shoppers out there! Now to talk about FOOD 🙂 Here are a few photos of what I’ve been eating lately and what the ingredients are. 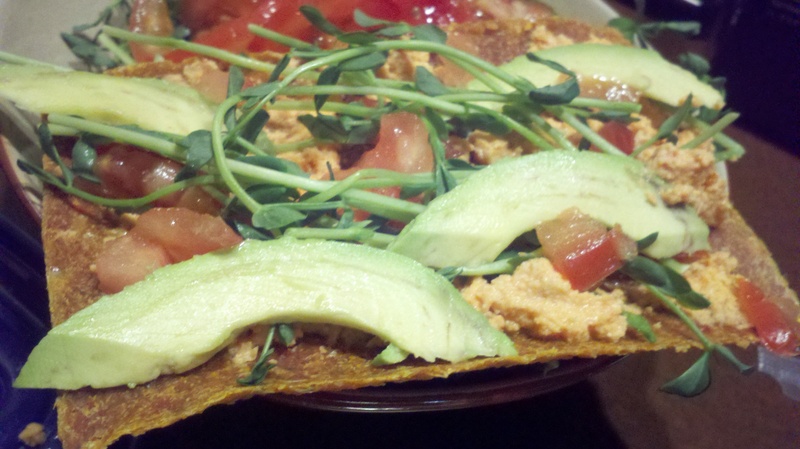 This first one is carrot pepper hummus with tomato, pea shoots and avocado in a Zaza Raw Spicy Tortilla. 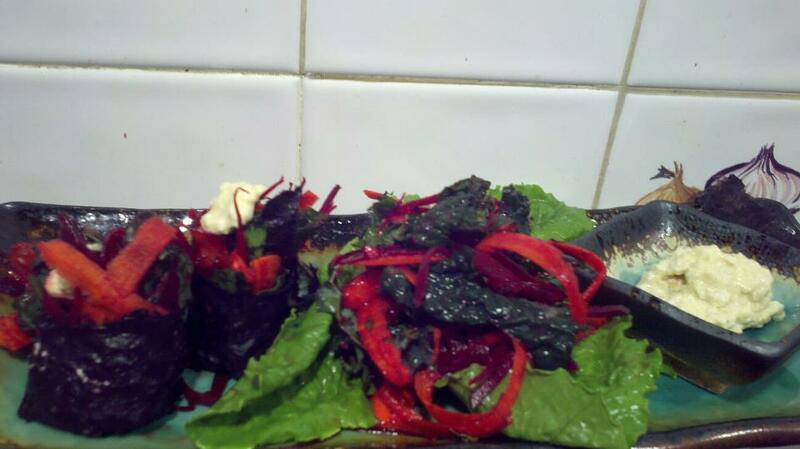 The wrap is spicy and insanely flavorful for only having seven ingredients. It has one of the best textures I’ve ever tried. Raw wraps bought in stores do not usually impress me. Zaza Raw’s tortillas are handmade, free of onions and garlic, and are organic. There are five wraps per package, only 20 calories per wrap. These wraps roll up easily and did not get soggy or tough on me. I’m pretty hooked to nori sheets right now. 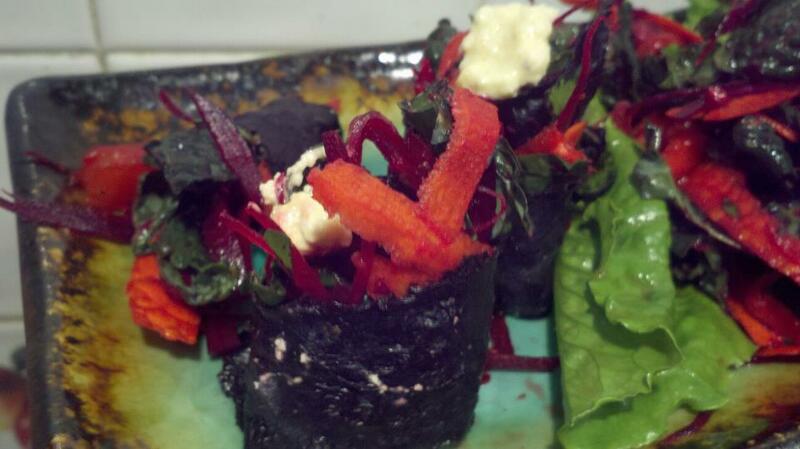 The other night I made a crazy “sushi roll” with a kale, beet, and carrot salad in the middle of the roll. I made a ginger curry cashew dipping sauce from some left over cashew yogurt. As you can see, it didn’t take much to get full from this dish. 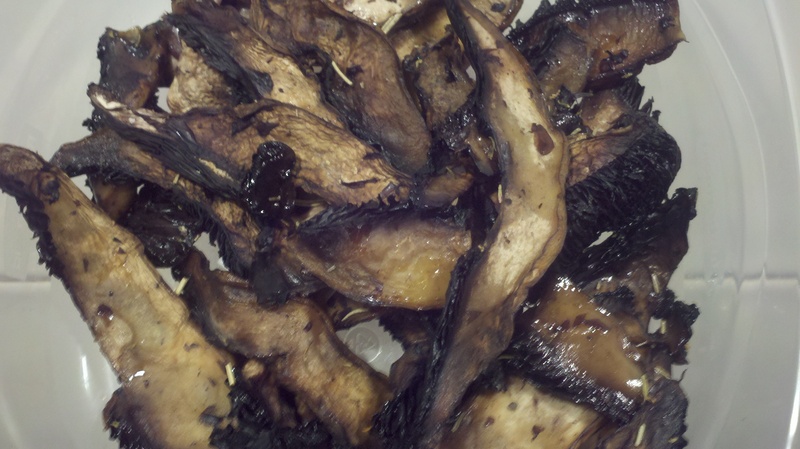 I’ve been getting a lot better at making my dehydrated marinated mushrooms to look cooked. Even though I love the peel on the top of mushroom tops, peeling them off gently with a knife and cutting the mushrooms a bit thin really gives a cooked look to them. I am still confusing friends and family when I eat this because from the distance I guess it looks like steak tips. My mother is having a Christmas Eve party at our house this year and I’ve been trying to think of something fun to make for myself. I have to work Christmas Eve so I will not have too much time to prepare and make food. I’m thinking about making Raw Butternut Squash Ravioli, how does that sound to you? It’s a recipe idea I’ve been working on in my head and I think I’ve thought about it long enough. 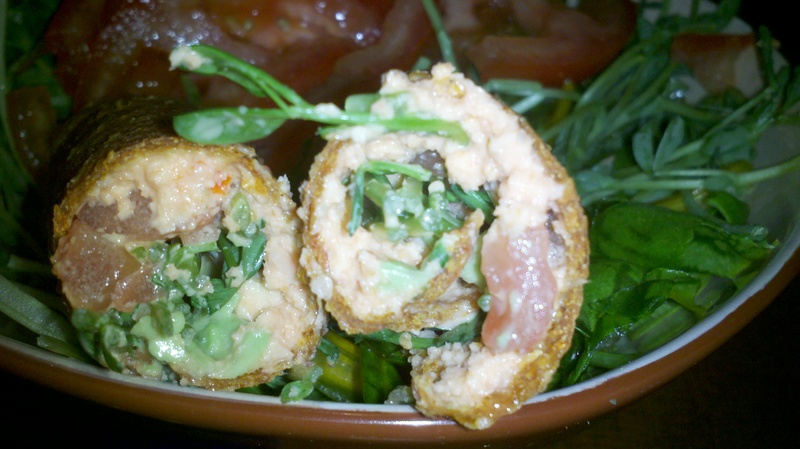 Here’s a cool Holiday raw meal recipe from Raw Food Recipes. I think the Holiday Medley Salad looks more appealing. I’m so tired of all of these recipes containing nuts though!